TrafficBroker.com is self serving adult adnetwork that connects webmasters that wish to make money off their websites with advertisers who wants to maximize exposure of their products. No matter how much is your budget, with our new completely independent self serving system reach out to millions of targeted customers and see instant results. - Get full control over your campaigns, budget expanses, filteration and campaign tracking. - Easily analyze traffic sources that generate you the highest revenue. - Filter relevant traffic types that fits your specific needs. - Competitive mobile traffic prices with many targeting options. As webmasters ourselves we know what you want and need : brand new intuitive design and out of the box features that actually make you more money. A. For which countries you want to show our ads and for which countries you want to show other network or ads codes. B. You can set a MIN CPC price, and this means that if we get a click and we cant pay the CPC price you wrote, we will send the visitor to their alternative code/url. And on top of the above, we pay for ALL GEOS (countries) and we offer very attractive dynamic tracks that can easily be seen within few hours instantly. - In depth, transparent information about your traffic. 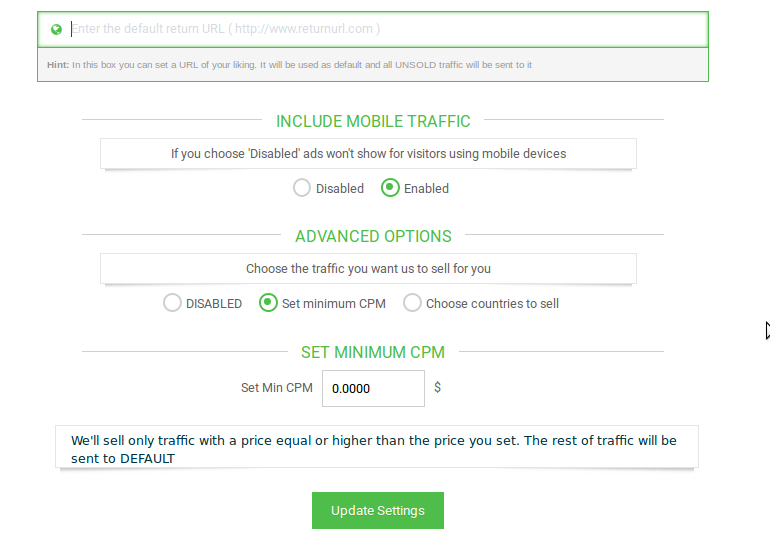 - Set your own minimum CPC,CPM or GEO traffic type to be automatically sold for you. - 5% Earnings for life for a user referred by you. You can add me on skype for assistance.